Made of plastic and electronic components, safe for your children to play. Mini star music show children's toy stand up microphone play set.Very entertaining for them and for us. Plug in your MP3 player, phone to play and sing along to your own tunes. Open the microphone has practical amplifying function, singing close to it may have better effect . 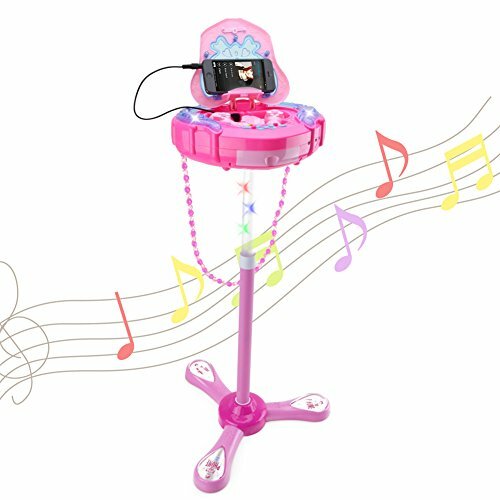 【Adjustable Stand】 The music microphone stand toy can adjust highly by adapts the different height child. 【sing along mic & mp3 】plug in your mp3 player, phone, computer, ipad, etc. To play and sing along to your own tunes! (aux cable included). 【adjust volume】the sing along karooke microphone machine has volume control if you want to adjust lower or louder. 【Good entertainment】unique kind of backgroud music and 2 sound effects: applause/booming. 【easy to assemble】 the music karaoke stand are easy to asseble,need insert 4*1. 5vv aa battery (not included). If you have any questions about this product by HANMUN, contact us by completing and submitting the form below. If you are looking for a specif part number, please include it with your message.